Since I cannot be present in more than one place, I am knocking on the door of your hearts through this message and asking you, boys and girls, to allow me to convey my best wishes of holiness and happiness to each of you. While you celebrate the beautiful feast of Don Bosco, I shall be in Sierra Leone in the continent of Africa, in the company of my Salesian confreres who chose to remain there right through the most difficult moments of the Ebola epidemic in order to be with the boys and girls who lost their father and mother in the epidemic and now have only us Salesians for their family. 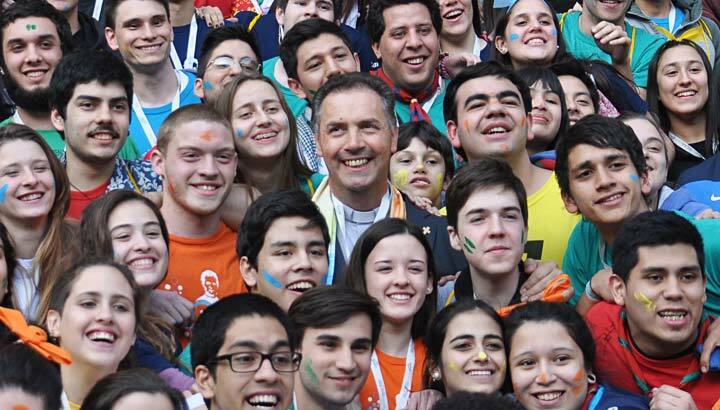 When I meet them, I shall tell them that the young people in Salesian presences all over the world and our whole Salesian Family think of them. And, as I think of you and of a message that could be a reference point for you on the feast of Don Bosco, I say this to you: My dear young people, allow yourselves to be captivated by Jesus. In line with what I suggested to the whole Salesian Family in all the world, I invite you to let your hearts be “stolen” by the Lord. My dear young people, do not be afraid of letting the Lord become a very important part of your lives. Do not be afraid of letting him penetrate your hearts so deeply that you cannot live without him. Perhaps someone will ask me why I am saying all this. Well, in the first place, because I love you, and I want all of you, boys and girls, to lead full and happy lives; secondly, because I know that Don Bosco would say this to you just as he said it to his boys of Valdocco; thirdly, and most importantly, because it is the truth: it is absolutely certain that with Jesus everything is seen in its proper light. Do not expect many in the society, city or place in which you live to extend this invitation to you. It is not fashionable. But, God’s love for each of you, my dear young people, is not a passing fad but a reality that reaches all places and persons if they allow his voice to resonate in their hearts. I propose that you stop as long as you can to listen to yourselves, to enter your own interior world and listen to your inner voice. I propose that, once you enter yourselves, you seek the presence of a God who is Love, Life and Newness itself: I invite you to have an experience of discovering and recognizing him. I propose that you let yourselves be helped in seeking God so that you learn to look at life as a blessing from God, marvelling at his presence and the imprints he has left in you, and recognizing him as someone who truly seeks you, is with you and lives in you. I propose that you live experiences that bring you to a personal encounter with Jesus, an encounter that will always fascinate you and give strength to your lives. I propose that you carry on maturing a true friendship with Jesus, a friendship that you will strengthen in personal and community prayer, and in the sacraments of the Eucharist and Reconciliation. I propose that you ask God the Father to grant you the gift of his Spirit so that he will make you choose to be decisively one of his own, one of those who follow Jesus. I propose that you grow in a greater appreciation of family, friendship, brotherhood and solidarity with those who suffer. I propose something else that is precious, viz. that you dare to take up the challenge of accepting life as a gift and a service, and this will certainly make you better and give full meaning to your lives. And I would want all these things to reach the point where they mature into your own plan for your life, turning God’s dream into reality for each of you because you know that, come what may, that dream will always be a guarantee of your happiness. My dear young people, I end my greeting in the way I began, viz. wishing you a very happy feast of our beloved Don Bosco. May the Help of Christians, the Mother who has done everything, accompany you and be a safe harbour for you, and may the Lord Jesus too accompany you, captivating your hearts and your lives. I warmly embrace you with sincere affection.